Magog, QC, April 19, 2017 – Camso, formerly Camoplast Solideal, will be attending later this month SMOPYC in Zaragoza, Spain, the international trade show for public works, construction and mining machinery. For many of those visiting the Camso booth 20-26 in Hall 6, it will be their first opportunity to see the company’s latest additions to the skid steer tire lineup : the Camso SKS 753 and Camso SKS 532. The Camso SKS 753 is the next generation of the popular Solideal Lifemaster SKZ tire, providing users with 30% more tire life, while the Camso SKS 532 surpasses its predecessor, the Solideal Xtra Wall, with 30% longer life. The company is also introducing a brand new next generation multi-purpose tire for telehandlers, compact wheel loaders and mini-dumpers. Built to maximize versatility and durability on mixed hard surfaces, the MPT 753 is the next generation of Solideal 4L I3, surpassing its predecessor with 29 % longer life. Its void guard and impact guard features bring enhanced puncture resistance, while its innovative non-directionnal tread pattern provides an excellent balance between traction and ride quality. Camso will also be showcasing tires for soil compactors, wheel loaders, articulated dump trucks, wheel excavators, forklifts and rubber tracks for mini-excavators. 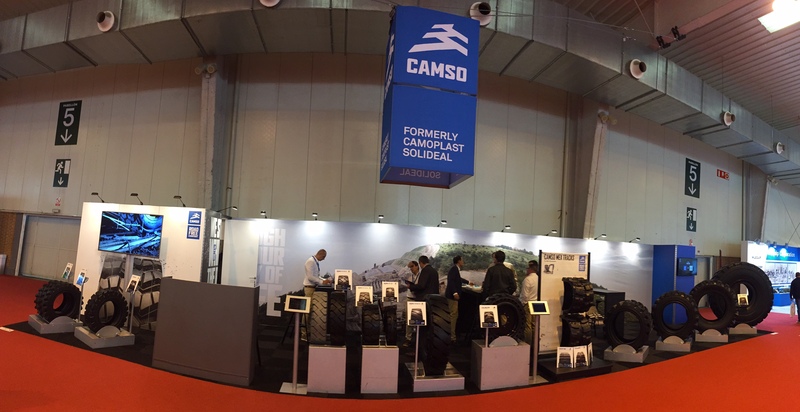 Camso being the market leader in compact construction tires and tracks, its products are engineered to provide the best performance and durability for their application. Founded in 1980 and held every three years, the SMOPYC is at its 17th edition and will showcase the very best in public works, construction and mining machinery. There will be more than 200 exhibitors from nearly 30 countries, representing every facet of the public works, construction, and mining machinery sectors. Camso will be prominently located in Hall 6, booths 20-26 , April 25 and 29.